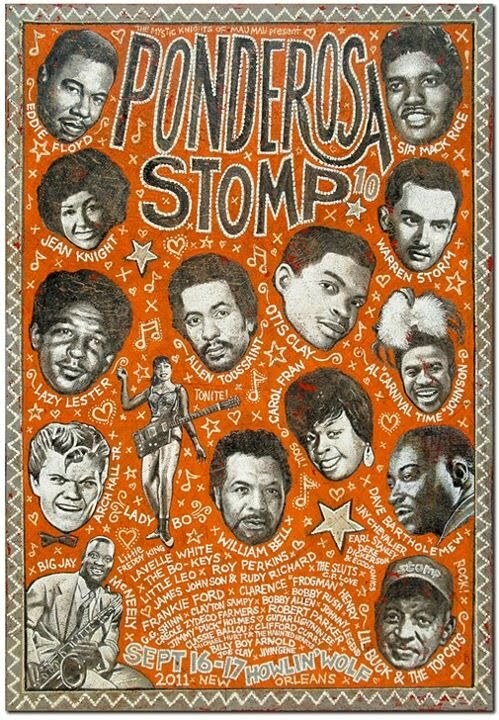 Last year marked the 10th anniversary of the Stomp, which grew from a series of shows at the Circle Bar to a weekend-long celebration of the unsung heroes of rock, soul, blues, rockabilly and swamp pop. It debuted at the Fine Arts Center, then moved to the Rock ‘n’ Bowl, where it expanded first to two stages and then to two rooms – the bowling alley’s upstairs and downstairs. Hurricane Katrina forced the 2006 Ponderosa Stomp to move to Memphis for a year, and when it returned to New Orleans, it moved to the House of Blues, where it also raised its profile by bringing in such high-profile artists as Ronnie Spector, Roky Erickson and the Flamin’ Groovies. It started programming shows in New York City and Austin, Texas during SXSW, and expanded the Stomp from the concerts to the oral history conference and film festival. At last year’s 10th anniversary shows, the Ponderosa Stomp renewed its focus on southern R&B, focusing one night on Allen Toussaint and Cosimo Matassa, and the next night on the legends of Memphis’ Stax Records. Presented the 10th Annual Ponderosa Stomp Festival, which has expanded to include a record show, Music History Conference, Clandestine Celluloid Film Series, Hip Drop DJ Party, in addition to the two nights of legendary music performances. Curated The Secret History of Louisiana Rock n’ Roll, the first museum exhibit of its kind – a much-belated celebration of the state’s formidable contribution to American music. The exhibit is currently open at The Louisiana State Museum. Have seen The Rock and Roll Hall of Fame and Museum officially designate J & M Studios a rock and roll landmark with an historic marker unveiling to kick-off the 9th Annual Ponderosa Stomp music festival in New Orleans. Terry Stewart, president and CEO of the Rock and Roll Hall of Fame and Museum and Ira “Dr. Ike” Padnos, co-founder of the Ponderosa Stomp, officially unveiled the Rock Hall’s 11th landmark at 840 N. Rampart Street in the French Quarter accompanied by Dave Bartholomew and Cosimo Matassa, two of the men that made J&M extraordinary. This year, Cosimo will be inducted into the Rock and Roll Hall of Fame. Launched an annual Music History Conference in partnership with the Rock ‘n’ Roll Hall of Fame and Museum. The Conference brings together American music historians, writers, educators and musicians to explore the heritage of American music through panel discussions and oral histories. Footage of conference interviews is archived at the Stomp, as well as the Rock Hall, capturing a significant repository of cultural history. Presented amazing summer concert and educational events in New York City in association with Lincoln Center for The Performing Arts for the last three years. One of the highlights of the collaborations was honoring the late Wardell Quezergue, one the giants of American music history, with a tribute as part of the Lincoln Center Festival. Another highlight was last year’s amazing She’s Got the Power! A Girl Group Extravaganza, presented in association with Lincoln Center Out of Doors presented by Lincoln Center for The Performing Arts. Partnered with The Recording Academy® Memphis Chapter to present the panel and networking event, Advocating for New Orleans’ Historical Music Treasures, which focused on why/how New Orleans should celebrate its local historical music treasures and locations and how it can market them to the world. Over the years we have grieved, also. We have lost many music legends, like Hubert Sumlin, Wardell Quezergue and Howard Tate just this past year, reminding us how finite the opportunity is to ensure the stories of American music heroes are captured and made available for the history books. In light of this, The Ponderosa Stomp Foundation has decided to dedicate our focus in 2012 to our educational and preservationist programs and activities. In the coming year, we will concentrate on building an online archive of the important videos and audio recordings we have collected, along with other projects that further our goals in these fields. We are very proud of the huge number of incredible musicians we’ve been able to showcase as well as building our film festival, music conference and record show. To prioritize the development these new programs, we will be moving the next Ponderosa Stomp Festival to fall of 2013. 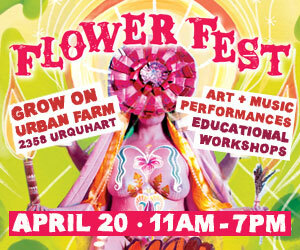 The extra year in between festivals will allow us the time and resources to focus on the Foundation’s other activities. Our continued growth and success would not be possible without our fans, donors, volunteers, collaborators and friends, so thank you from everyone at the Stomp family. 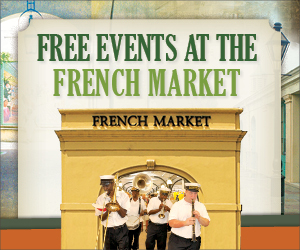 We hope to see everyone in New Orleans in 2013 and please look for announcements in the coming months on our other exciting new program developments.